Having completed 4 months of chemo and recovered well from my operation, the last phase of my treatment was to complete 5 weeks of radiotherapy, which was 20 minutes every day Monday – Friday. They say that radiotherapy can be physically quite tiring as you are basically radiating your cells to kill any minuscule cancer cells that might be floating around so your body is using up it’s energy to repair the damaged healthy cells. The only thing I found tiring, fortunately, was having to go to the hospital every day for 5 weeks. My advice would be to look at your radiotherapy as a timeline for something you want to accomplish. For me, I saw it as an opportunity to gently ease myself back into being active again after my operation. My hospital was a 30 minute walk from my home so I bought a nice pair of comfortable and funky runners for me to wear every day. I would pick the pace up every day and by the end of the first week, it took me 25 minutes to walk to the hospital. By the end of the second week, I started power walking and it then took me only 20 minutes to walk there. The best trick to ensure that you power walk is to leave the house intentionally later than you should! 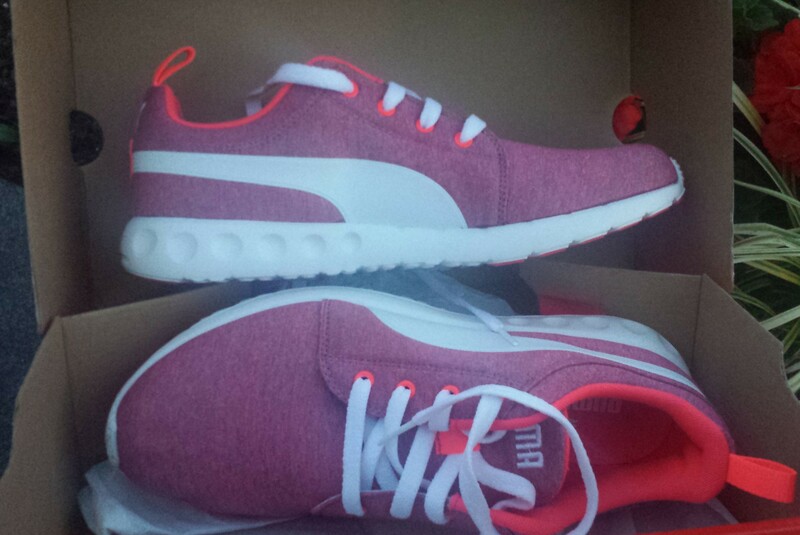 On sale for £35 from Puma, Westfield, London. 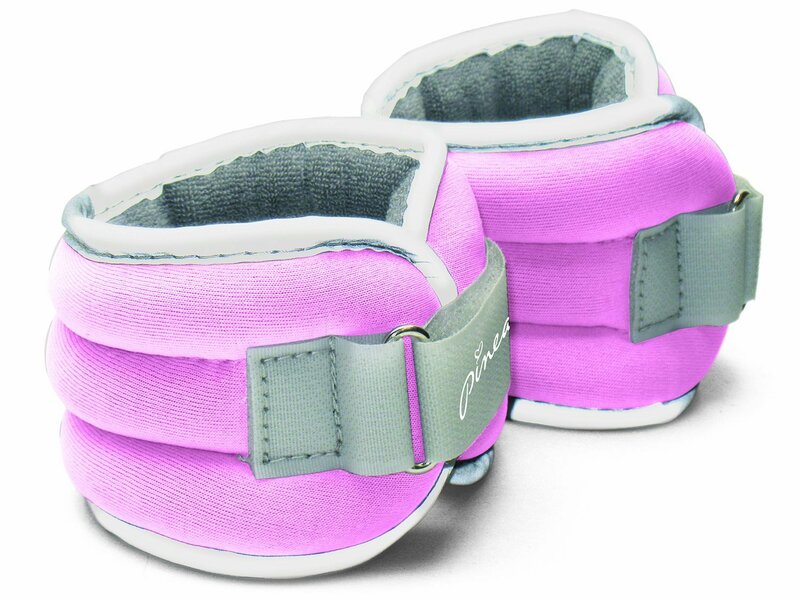 It was amazing how quick the weeks flew by and during the third week, I bought Pineapple pink arm weights from TK Max for £9.99. 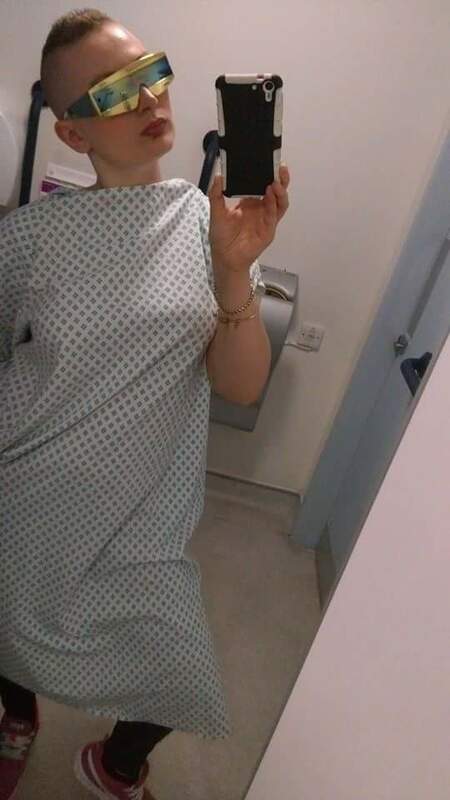 It’s great living in London as I never cared what I looked like wearing these on my daily walk to the hospital. At least they were pink and looked like thick ’80 style wrist bands! My tip for any Radiotherapy Queens who are experiencing tiredness and lack of energy is to drink Matcha Green Tea. It will energize you and give you more of a caffeine kick than coffee. Also perfect for anyone who is struggling to give up milky coffees. Matcha is a fine powder of green tea leaves from Japan which are grown under cover to increase its chlorophyll. It’s a super-concentrated powder packed with antioxidants, nutrients and amino acids. You will need a mini frother to mix the powder in your hot water so pick one up in a shop as it would be cheaper than buying this from their website. I learned that to drink green tea using a tea bag is the equivalent of boiling spinach in a pot of water and throwing away the spinach and just drinking the water. You need to ingest the leaves to get the maximum benefits. Though it’s expensive (30g for £25 or 80g for £55), it lasts forever as you need the tiniest bit to make a big cup of tea and it can be thrown in smoothies, yogurt, milk and soups. If you know anyone undergoing radio theraphy, the Matcha ‘Starter Kit’ would make the perfect present. 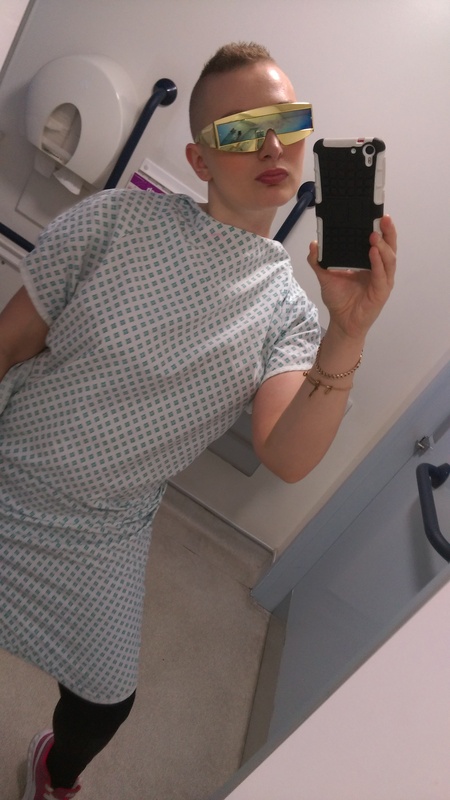 Here I am showing off my High Fashion Hospital Gown on my last day of Radiotherapy on 22nd July 2015. Whilst chemo is a drip in to your hand, radiotherapy is just like going for an x-ray. It doesn’t hurt at all while they are zapping you, the only thing you have to do is to lie down on a table, put your hands above you and to not move at all. Not even a centimeter. The nurses push and prod you to ensure you are in the exact position on the table while they shout random numbers and measurements to each other, measuring various parts of you with a ruler that you start to feel like the special muse of mathematical problem that needs solving. Whilst the actual process isn’t painful, the skin where you are getting treated starts to look like sunburn after the first week and then continues to get redder and more tender as your treatment continues. Make sure to have your Aqueous cream bought before you start treatment; buy two tubs of it to keep one in the bathroom and one in the bedroom so it’s always on hand. It’s the only cream you are allowed to use to moisturise that doesn’t interfere with the radiation and it also doubled up as a great hair gel for my Mohawk! At your first session of radiotherapy, the nurse tattoos you permanently with three teeny tiny black dots (one on the chest, and under either side of the armpit) in order for them to be able to line up the machine’s lazer light on you accurately. I’m quite proud of my first and only “tattoos”. Just like Phoebe from Friends, when she went to a tattoo parlour with Rachel and came back with a pin prick, my teeny tiny black dots are “the earth as seen from a great great distance”. Previous Post (Safe)Tanning in the Rain! Next Post Body & Soul, Here I go! Love the sci-fi gold glasses persona. Tres’ 25th Century.